Syros Sound Meetings, a self-funded initiative now in its fifth year, invites theorists, practitioners and researchers of all levels & backgrounds with a documented interest in sound & music, for a joint 10-day residency in the island of Syros, Greece. 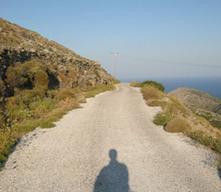 Staying at the converted guesthouse of a 17th-century Jesuit Monastery on the historic Ano Syros hillside, resident participants will have time to work individually and together, listening, writing, recording and creatively engaging on site-specific or site-inspired projects. Upon completion, the residency is expected to lead to one or more individual and collaborative publications and/or releases, whose form, contents and mode(s) of dissemination will be discussed and determined during the ten-day period itself. Applications are especially encouraged from student, graduate and professional artists and researchers working with sound and/or texts across different media, and interested in the possible intersections between theory, ethnography, and practice-based research. Please fill in application form at http://goo.gl/forms/CyDm7ML2Kk and send a brief cv and any samples of recent / relevant theoretical and/or practical work to soundmeetings@gmail.com. Αs there are only a few rooms available at the Old Jesuit Monastery, the final choice will depend on the total number of applications received, as well as the degree of affinity between individual participants' interests & proposed subject areas.